As Lutheran Christians, we love the Good News of Jesus Christ who comes to give us the forgiveness of sins, new life, and salvation from the cradle to the cross with His Word and Sacraments! The salvation Christ has earned on the cross and empty tomb is for you by grace through faith. If you do not have a church home, you are invited to join this community of faith. Come here for rest from the weight of sin and despair to recieve forgiveness, hope, and life. Jesus loves you! He has commanded us to bring you His loving message. We are glad to do that! We invite you to worship with us each Sunday. Our worship service is at 10:30 am. Sunday School and Bible Class starts at 9 am. Contact Us and leave your message, name and phone number for more information. First Lutheran found its start in early 1946 as a mission congregation, meeting for its first service at the Seventh Day Adventist church on Kellogg St. with 28 people attending an evening service. Charter members of the church were A. Kropel, Winston Holton, Andrew Stuhr, and Fred Rathke with P. Barnes, C. Bailey, H. Kreiter, H.M. Brady, F. F. Koehler and G. F. Hansel joining soon after. The first voters’ meeting was held May 28, 1946 and officers were selected, a name for the church, a constitution adopted, and the Ladies’ Society was organized. The church joined the English District of the Evangelical Lutheran Synod of Missouri, Ohio and other states in 1947 and remained until 1952 when it transferred to the Southern California District of the Missouri Synod. 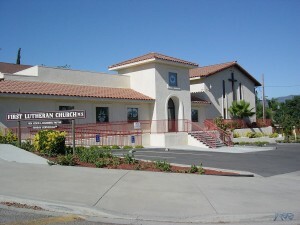 The church remained in mission status until 1974 when Rev. Rodger Gredvig was installed as the first “called minister” to the pulpit. Serving during the mission period shared pastors with Corona and Perris were Rev. Albert C. Young, Rev. A. H. Herkamp, Rev. Luther P.J. Steiner, Rev. Ronald Kusel and Rev. Henry C. Elfman. Rev. Rodger Gedvig was succeeded by Rev. Robert Yount who served until 1988, followed by Rev. James Knotek who served until 1995, Rev. Scott Christenson from 1996-97 and since September 1998 the Rev. Kevin L. Kolander has served the congregation. The early services were held at the Seventh Day Adventist Church on Kellogg Street for which we paid a rental of $20.00— later changed to $25.00 per month. In late 1946 and early 1947, the United States Government was disposing of surplus buildings erected for war time needs, and the Church elected to purchase a building from Camp Haan , which was located near March Field, to convert to a church. In October of 1947 two lots and the building were purchased at our present location through contributions and loans from various individuals and the District Extension Service. In 1978 the congregation began planning for a new church structure which was completed and dedicated on March1982. Under the Lord’s guidance, First Lutheran continued to grow leading to the need for a larger Fellowship Hall which could accommodate the membership. The expansion of the Fellowship Hall entered the planning phase in 1998, with construction starting in January 2002. Major portion of the financing has been provided by the generous contributions of members and friends, with additional support through the Lutheran Church Extension Fund. 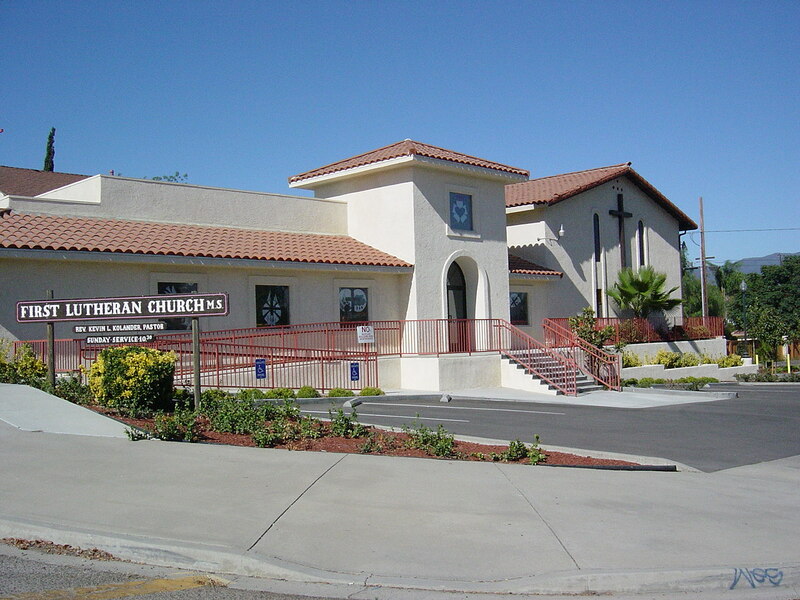 With the Lord’s blessing First Lutheran dedicated the new facilities on Nov. 24, 2002 , and looks forward to continued service and growth in the Lake Elsinore community. First Lutheran found its start in early 1946 as a mission congregation, meeting for its first service at the Seventh Day Adventist church on Kellogg St. with 28 people attending an evening service. In 1978 the congregation began planning for a new church structure which was completed and dedicated on March1982. Under the Lord’s guidance, First Lutheran continued to grow leading to the need for a larger Fellowship Hall which could accommodate the membership.